Our Climatedogs drive Australia’s climate in different ways at different times of the year. There is now an approximately a 70 per cent chance of an El Niño event developing before the end of the year. Such late developing events (such as 1991 and 2009) don’t have a clear pattern as to what we could expect next. It’s likely that a positive Indian ocean dipole is currently underway, but we should expect a return to more neutral IOD conditions throughout the month. October offered some reprieve from dry conditions with areas in the west and north east receiving above average rainfall. 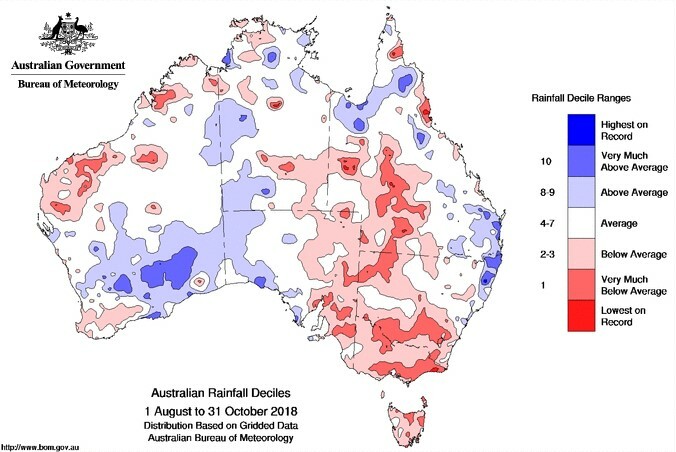 Below average rainfall in key agricultural regions in South Australia, Victoria, southern New South Wales and Tasmania put increasing pressure on grain, livestock and dairy producers in what has been a very dry spring. Figure 1. Rainfall deciles for October 2018. Figure 2. 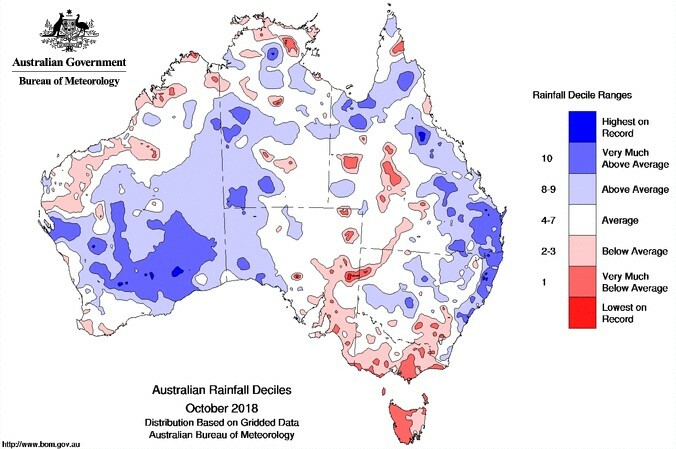 Rainfall deciles for August to October 2018. The November to January rainfall outlook looks to be continuing the 2018 trend, with rainfall likely to be drier than average for many areas across the country. Figure 3. 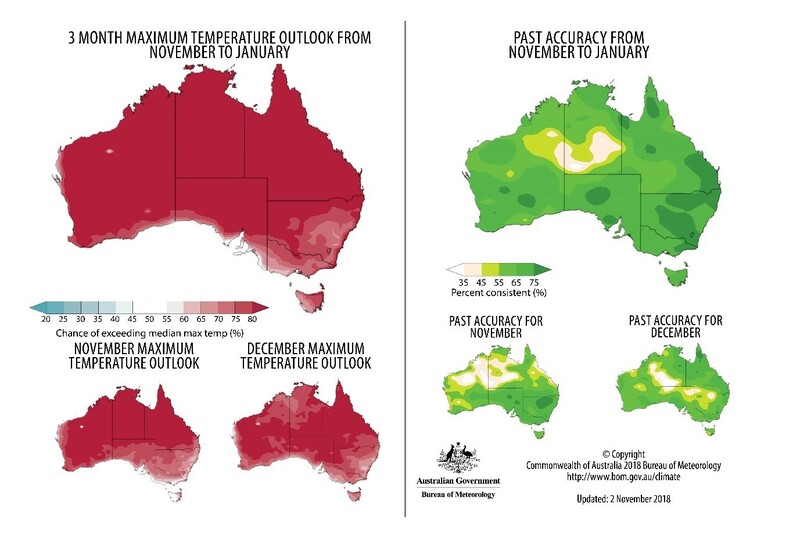 Australian outlook for November to January 2018. 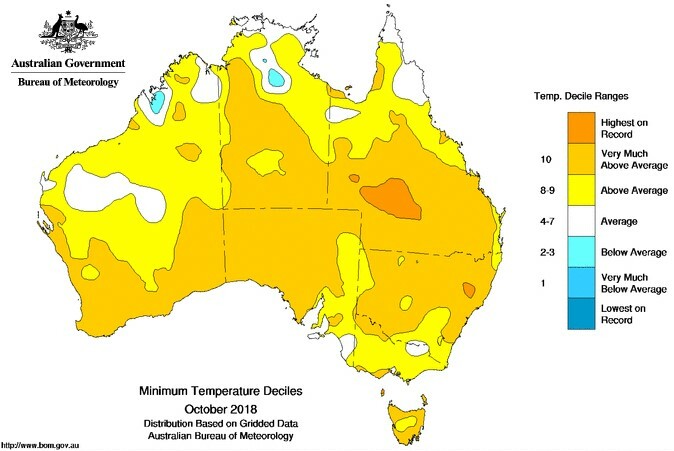 Yellow has been the dominant colour in October, with both maximum and minimum temperatures above average for almost all of Australia. A combination of low rainfall and frost conditions has seen significant hay being cut in south-east grain growing regions. Figure 4. 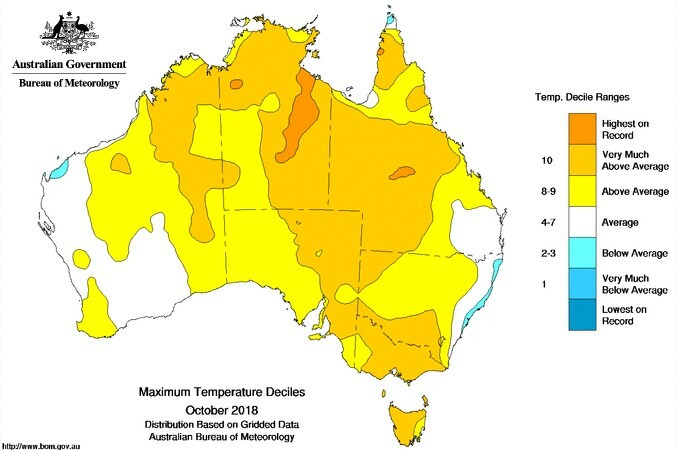 Maximum temperature deciles for October 2018. Figure 5. Minimum temperature deciles for October 2018. Forecasts suggest the whole country will experience above average maximum temperatures from November to January. Figure 6. November to January maximum temperature outlook, 25 October 2018. 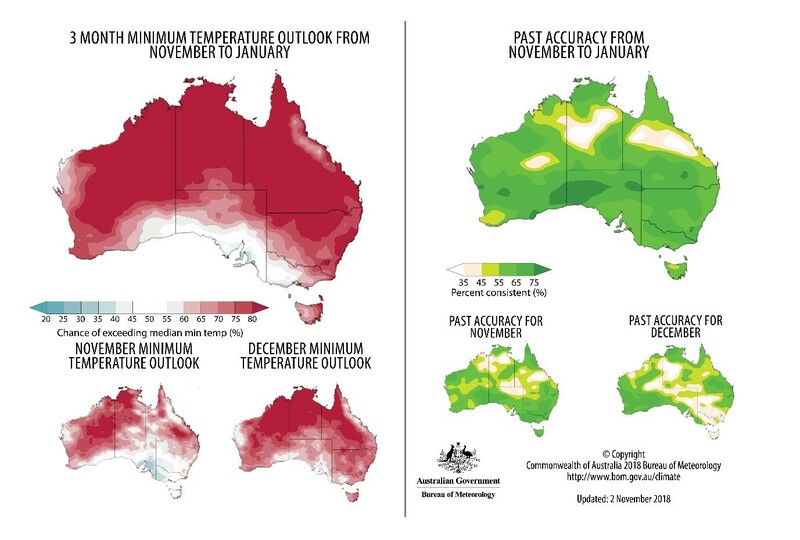 Minimum temperatures are forecast to be average to above average for Australia, except for areas surrounding the Great Australian Bight and areas of Western Victoria where average minimum temperatures are predicted. Figure 7. November to January minimum temperature outlook, 25 October 2018.